Garage World Townsville - Why Choose Us? Quality and affordability has been the core of Garage World Townsville for over 15 years. Our customers build with us because they need reliable, qualified local builders and steel buildings that will last and add value to their properties. We use only premium quality materials and take great pride in our reputation for delivering genuine customer service and good looking, durable sheds, garages, carports and commercial steel buildings that you can be proud of. No job is too big or too small for the professionals at Garage World Townsville. Regardless of how much you're spending we believe you deserve no less than the best. Value for Money - our steel buildings add value to your property and are built to withstand the tests of time. Beautiful Building Designs - COLORBOND® steel colours and modern, independently engineered designs that meet Australian standards. Premium Quality Materials - Heavy galvanized steel anchor brackets and patented, wrap around Morinda knee and apex joints built to withstand extreme weather. 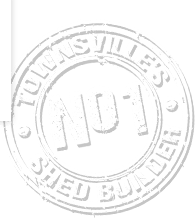 Local Products & Service - Our outlets are independently owned and our sheds are built with Australian products by local builders, with local support and supplier warranties. Experienced and Professional Craftsmanship - We take old fashion pride in our work and it shows in everything we do. From your free quote to getting the job done on time and on budget with no hassles. Joints are the most important engineering consideration in your shed and ours are recognised as one of the best in the industry. Garage World's patented Morinda Glove Section Bracket System includes fully wrap around knee and apex joints that are made from heavy galvanised steel and feature pre-punched screw holes for quick and correct installation. Non-welded and corrosion free, Morinda brackets are securely fixed with galvanised bolts to make sure they stay strong and last.